When people change everybody does seh how de person tun over a new leaf. When a man use to drink and drunk everyday and fall down pun de road, when he stop, everybody does be glad. Dem is de people who does tell everybody how So and So tun over a new leaf. 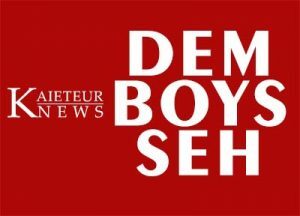 Dem boys seh Jagdeo tun over a new leaf. He was a man who use to refuse to listen to anybody. If he doing something wrong and people talk, he couldn’t care. He and Jimmy Carter even fall out because de old man mek a wise proposal and Jagdeo tell him to carry he proposal wheh de monkey put de nut. Was de same thing wid Aunty Janet. She mek a comment bout something Jagdeo did and de man put she to she place. He tell de whole country how she is a private citizen. Now this is de same man who offering advice to everybody. In fact, most of de advice is fuh de coalition. He tell dem don’t sign no new contract because he gun scrap dem. Then he advise dem to talk about all de oil money dem get. He seh dem must put it in de consolidated fund. But dem boys remember this was de same man who refuse to even seh how much money he collect from de lotto funds. He even refuse to put it in de consolidate fund and he seh loud and clear, he had no apology to give nobody. He collect money from GTT. That company use to pay a special fund to de government. Jagdeo use to keep it secret. To this day that money spend and nobody don’t know how. That is why dem boys seh in those days he was a heathen. Now he going to church, temple and masjid regularly. That is why he tun over a new leaf. This is a man who change he wicked ways. Dem boys watching him and shaking dem head. Dem doing de same fuh de courts wid its simple and absolute. Talk half and watch how tiger can hide he spots.